eBay Store category Sign Up Now ! 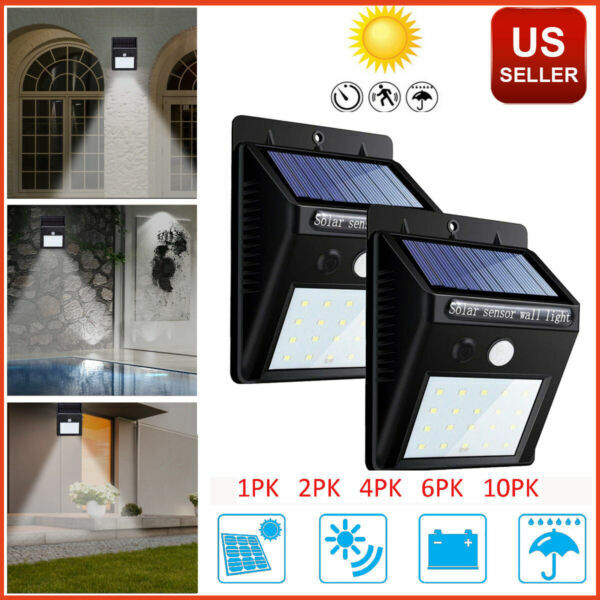 You may also like Outdoor Solar Lights Motion Sensor Wall Light Waterproof Garden Yard Lamp 20 LED Product Description StyleModernCustom BundleNoMaterialPlasticPower SourceSolarSensor Angle90°~120°TypePath/GardenSensitivity Distance5MIP RatingIP65Solar Panel5.5V 0.55WFeaturesMotion Activated,Solar SensorColorBlackMPNDoes Not ApplyNon-Domestic ProductNoBulb TypeLEDBrandKW Ship from USA,Fast delivery,one year waranty,pls don't hesitate to order! Great lights for front door, yard, garden, patio, pathway,driveway, aisle, porch, patio, flood, hurricane emergency use etc. Energy-saving and eco-friendly lights, never rely on electricity any more. Solar Powered Wireless LightsBuilt-in rechargeable battery,there is no need to replace the battery.If the night light is not bright enough,please make sure it be fully charged under directly sunlight.Easily Install:Wireless and easy to mount with the included screw. Lighting Modes: Human Induction + Light ControlDuring the night time or at the dark area, it will auto turn on light when it sensing human movement, and it delays 20-30 seconds when people walk out of it's sensing rang then it will turn off.Specifications:1. Li-ion battery: 1200mAH2. Voltage: 3.7V3. LED power: 0.2W4. PIR (Motion) detection angle and distance: 120°, 10ft.5. Delay time: 25-30s.6. Switch: OFF/AUTO7. Lighting mode:- ON- OFF8.Waterproof and Durable: This light is waterproof and durable with solid hard plastic construction which can withstand years of usage. 9. Color: Black10.Weight:5.32ounces11.Size: 4.9*3.8*1.9inches* Package Included1 x Solar Motion Sensor Lights1 x Expansion pillar-hinges1 x Screws1 x Key pins1 x Manual Thanks for looking,Ship from USA,Fast delivery,one year waranty,pls don't hesitate to order! 1 Payment Delivery details Terms of sales About us Contact us Payment 1. We accept PayPal only. We only ship the item(s) you purchased to your PayPal shipping address. 2. If you are paying through Paypal using eCheck, note that your item can be shipped only after eCheck has cleared. Delivery details 1. We are not responsible for undeliverable address. We reserve the right to charge the shipping fee again for returned items due to wrong address supplied by buyer. Any non-received items caused by invalid address registered on PayPal are not in our full refund or replacement policy. 2. Items are generally shipped out with 2 business day after your payment has been cleared (Sat. & Sun. & Public holiday excluded.) 3. The delivery time takes 4~6 business days. Terms of sales 1. This product has a 30 days warranty. 2. Our warranty does not extended to any products that are physically damaged or that are not under normal operating conditions as a result of misuse or improper installation on the buyer/user's part. 3. For all returned products, buyers MUST contact us for the returning address. 4. The customer is responsible for all return shipping charges.Refund will be offered once we received the returned items. About us If you have any questions, Please feel free to contact us by eBay message, we will reply you within one business day. Contact us If you have any questions, Please feel free to contact us by eBay message, we will reply you within one business day. 1. We will leave Positive Feedback after receive payment,Please do not forget to give us Positive Feedback and FIVE STARS on all of the Detailed Seller Ratings. 2. If you are not satisfied with your shopping Experience,please contact us to get a solution before you decide to leave a Neutral or Negative feedback,we will do our best to solve any problem for you as soon as posible,thanks! Feedback Great lights for front door, yard, garden, patio, pathway,driveway, aisle, porch, patio, flood, hurricane emergency use etc. Energy-saving and eco-friendly lights, never rely on electricity any more. Solar Powered Wireless Lights Built-in rechargeable battery,there is no need to replace the battery. If the night light is not bright enough,please make sure it be fully charged under directly sunlight. Easily Install: Wireless and easy to mount with the included screw. Lighting Modes: Human Induction + Light Control During the night time or at the dark area, it will auto turn on light when it sensing human movement, and it delays 20-30 seconds when people walk out of it's sensing rang then it will turn off.